The Golden Retriever was first developed at the Scottish country estate of Lord Tweedmouth, during the 1860s, to assist in the retrieving of upland game and waterfowl. This extremely lovable dog usually lives up to 11 years of age, but with lots of love and attention and fed the right food Golden Retrievers can often live up to 13 years. These animals should weigh up to 27kg for the females and reach 51cm in height while the males normally grow to 61cm tall and weigh up to 40kg. 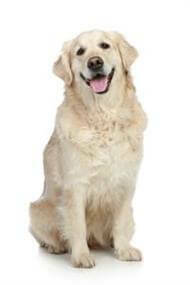 The Golden Retriever is an intelligent, affectionate dog, both active and powerful, with a kindly expression. The instinct to retrieve is still an important characteristic of the breed, however, the Golden Retriever's willing, adaptable nature and physical attributes make it an exceptionally versatile breed. It has been used in a wide range of activities such as gundog, guide dog for the blind, therapy pet, obedience and show dog. Although a longhaired breed, the Golden Retriever is easy to keep well groomed with regular brushing to prevent the hair from matting. Regularly check for ticks, fleas, grass seeds or any skin irritation while brushing your dog. They are very sociable dogs and need companionship; they are not happy left alone in the back yard for too long and may become destructive. Never allow your dog to roam free unsupervised. Basic training is an important part of responsible dog ownership. Your Golden Retriever will learn to be a better companion, establishing a stronger bond with you and generally acquiring the good manners and obedient responses that will make it a social asset rather than a nuisance. Both male and female Golden Retrievers are easy to house-train. The Golden Retriever, in common with most breeds, is subject to some problems that may be passed on from parent to puppy, including Hip Dysplasia (HD), some eye complaints and poor temperament. Consult your vet concerning any additional information about these and other health problems. A reputable breeder will have no hesitation in allowing an independent vet of your choosing to evaluate a puppy prior to purchase. Families looking for a dog with a gentle and loving disposition.